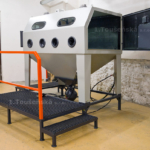 Standard Manual Blast Cabinets – 1.Toušeňská s.r.o. 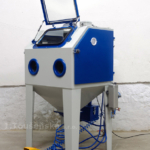 The standard sizes of manual blast cabinets range in sizes 70, 90, 120, 150, and 200 cm, both in pressure and in injector versions. 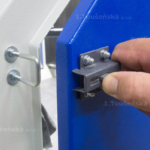 If required it is possible to attach a removable hopper which allows fast alternation of both systems. These devices are designed so that they meet all the request of our client. 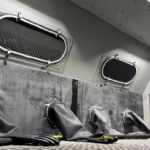 Special attention is always paid to operator´s comfort, fast cleaning, and productivity. According to your needs, the cabinets may be equipped with number of accessories increasing their efficiency, such as: telescopic nozzle holder, turntable, draw-through openings in side doors, top opening view window, etc. . Click on supplementary equipment and accessories to see more. In case it is essential to avoid iron contamination of noble metal workpieces during the process of surface treatment, we are able to provide you with a device made of stainless steel. 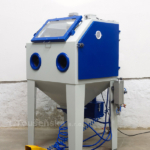 Practically any abrasive medium acan be used for these machines; furthermore, they are designed for the possibility of frequent changes of abrasive material. 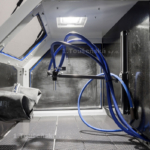 Our solution of blast cabinet interior allows easy cleaning, which is very important e. g. for glass bead blasting. The top window on the cabinet is made of a double layer glass with the inner one easily replaceable. Designing these manual blast cabinets, we prefer side-door insertion as it eliminates the overall dustiness of the machine. 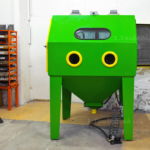 Larger cabinets of size 150 and 200 cm are equipped with two sections for easier blasting of longer components. Cabinets are treated with quality and durable surface layer by powder coatings. Based on a wish we can provide our clients with various colour versions. 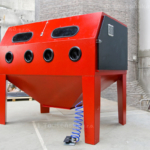 The inside is lined with rubber in order to increase service life of the machine and simultaneously to lower the noise during the blasting proces. 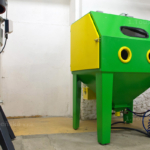 In case a standard blast cabinet with supplementary equipment still does not meet your requirements, we will help you to find an individual solution.. Click on special manual blast cabinets to see some examples. .